March 30, 2017 (Wishful-Thinking) - MakerBot is an American-based 3D printer company that gained prominence among the maker community with its originally opensource, consumer-friendly machines. Makerspaces, schools, institutions, and individuals around the world enthusiastically adopted MakerBot’s hardware and joined its online 3D model library, Thingiverse. In reality, there can be no “Apple of 3D printing.” There can be no centralized monopoly of 3D printing because 3D printing itself is a function of decentralization. 3D printers are machines that can make virtually anything out of a wide and ever-growing variety of materials. For now, virtually anything you may buy made of plastic can be fabricated with 3D printing. In the future, everything including ceramics, glass, and even metal will be 3D printed as well with large, expensive machines already doing so, used by automotive, aerospace, and other heavy industrial companies. With a 3D printer, you have what is essentially a miniature factory on your tabletop. With 3D design software, you are able to create your own designs. With an internet connection, you have access to one of many online 3D model libraries, many of which offer models for downloading for free. With a 3D scanner, you can capture the physical characteristics of real world objects and print them. 3D printing, thus represents the decentralization of manufacturing. 3D printers themselves are subject to their own disruptive nature, with printers being used to turn out the next generation of components for future 3D printer designs. In such an industry, the notion of monopolizing and dominating the market is irrational, and not just theoretically, but tangibly. 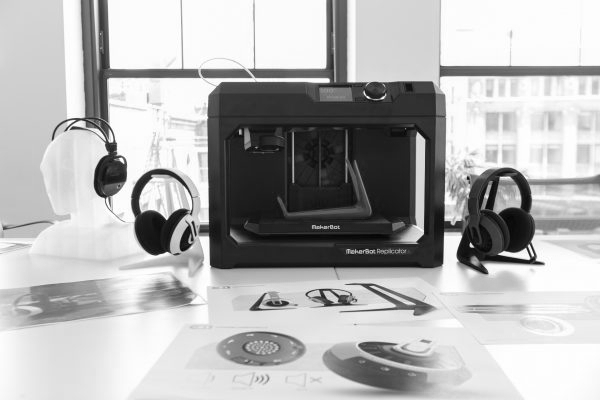 Makerbot’s new CEO Nadav Goshen announced a significant restructuring of the company in order to meet with growing challenges in the desktop 3D printing market. The Stratasys subsidiary will be cutting 30% of its workforce in an effort to reorganize the staff into small groups around specific product offerings. The announcement is only the most recent in a series of setbacks for the company. It has suffered similar “restructurings” in years past. March 29, 2017 (Wishful-Thinking) - Despite sensational headlines and opportunistic politicking regarding the threat automation poses to socioeconomic stability, with a fully informed, properly educated population, more opportunities than threats lie ahead of us in the near future. Automation has since the Industrial Revolution replaced human jobs with machines. As technology advances and automation evolves, the socioeconomic landscape of human civilization has evolved with it. For instance, the initial Industrial Revolution disrupted centuries of multidisciplinary crafts and trades where cottage industry consisting of individuals or small groups of people carried out the entire process of production. As technology merges information with the physical world, processes like 3D design, personal manufacturing, business administration, marketing, and even logistics are beginning to merge again. So are fears that automation will displace human labor and disrupt socioeconomic stability warranted? Yes and no. In China, according to MIT Technology Review’s article, “China Is Building a Robot Army of Model Workers,” millions of workers face potential unemployment as factories replace thousands of jobs at a time as automation advances and robotics improve. Millions of low-skilled migrant workers found employment in gigantic factories, producing an unimaginable range of products, from socks to servers. And in here lies the problem, a poorly educated, low-skilled workforce. For low-skilled workers, robots are indisputably a threat. Once they lose their job, finding employment elsewhere becomes a necessity. As these workers continue to move away from companies replacing human labor with automation, competition for remaining jobs suitable for low-skilled workers increases. The concept of a universal basic income revolves around the idea of offering every individual, regardless of existing welfare benefits or earned income, a non-conditional flat-rate payment, with any income earned above that taxed progressively. The intention is to provide a basic economic platform on which people can build their lives, whether they choose to earn, learn, care or set up a business. However utopian or empathetic such a concept may seem, it essential seeks to place millions, if not billions of people under the control of highly centralized special interests, many of which will simultaneously monopolize all means of production. Such a scenario invites immense abuse with a population so hopelessly dependent on these centralized special interests, should abuse take place, little or nothing could keep it in check. However, real solutions to expanding automation and the jobs it threatens do exist, offering an alternative future. What's Really Behind the Rise of the Cashless Economy? January 29, 2017 (Tony Cartalucci - LocalOrg) - Geopolitical analyst, journalist, and activist James Corbett of the Corbett Report steps viewers through the real story behind India's recent, massive demonetization efforts - the story untold by prominent news agencies - and untold for a very good reason. Corbett reveals the US develop agency USAID's role in preparing India for its demonetization campaign, as well as the special interests both within and beyond India's borders driving the efforts. India's financial and economic shake up is a warning shot for the world - that the battle of financial technology to either liberate us all through decentralized peer-to-peer blockchain currencies, or render us under a centralized, global financial control grid ruled by a small circle of corporate-financier special interests is coming to a head. For those to whom cryptocurrencies like BitCoin is a hobby, what has just transpired in India may provide the impetus to expand efforts to perfect and proliferate blockchain technology before cashless payment systems take over and displace all forms of currency, old and new. For those who have yet to dig into cryptocurrencies or the details behind the emerging cashless global economy, Corbett's latest video is the perfect springboard into both.